Sadie and Mae both received a few books today for Little Christmas. They were actually presents that I'd bought a while back and put away for Christmas, and completely forgotten about. 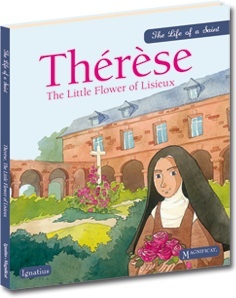 Sadie was excited to find two Gospel Coloring Books, that she immediately set to work coloring, and a copy of Therese the Little Flower of Lisieux. Mae ignored her two gifts, which were My First Pictures of Christmas and My First Pictures of Mary (although Sadie loved them!). Me: "Maybe we'll have one in our house someday..."
Sadie: "I want one.... and a yellow dress too!" 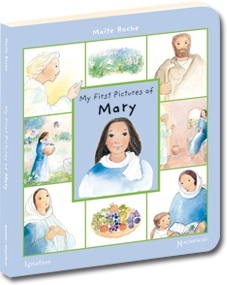 The little girl Therese who was kneeling in the picture was wearing a yellow dress. Which brings me to Sadie's latest comment/question that follows me around throughout the day. Whether she's looking at an American Girl catalog or turning the pages of her Saint Therese book she'll frequently ask: "Do we have this fabric?" while pointing to a dress. When I say no (because we don't have the exact fabric) she'll say: "Yes we do. We have pink. We have pink fabric." Apparently this is when I'm supposed to volunteer to run and get my sewing machine and whip whatever dress she's pointing to, right up. Because she thinks I'm a little slow on the uptake she'll sometimes make herself a bit clearer by adding: "Can you make me this dress?" Her belief that I make pretty much everything does make shopping with her easier. She doesn't expect things to come from the store... but I think she has a dozen or so projects she'd like me to get to work on! They still make American Girl dolls? I soooo wanted the Kirsten doll when I was little but they were too expensive. Aw I've been looking for some good books like that! Thanks!